Trying to figure out how much it'll cost to get the crack welded up. 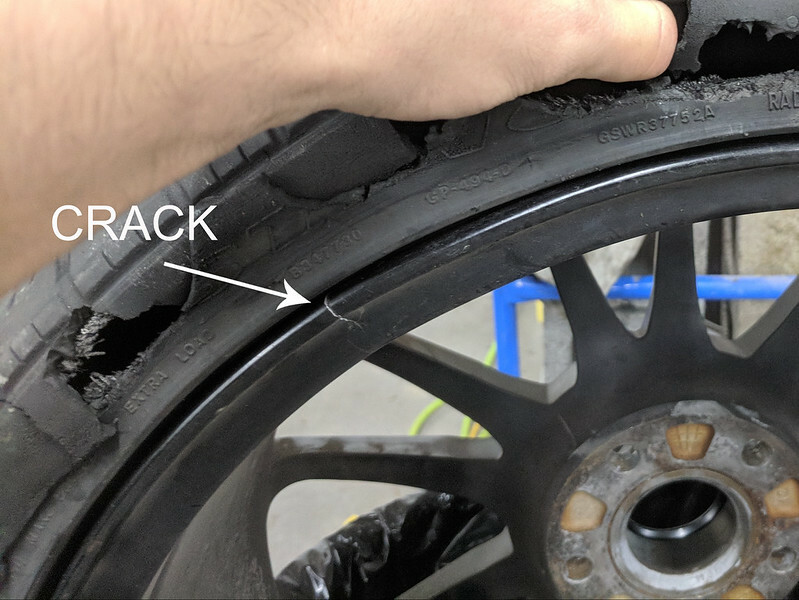 I have no experience with this but have made a phone call to one reputable wheel repair place I know. While I'm at it I figure I might as well powder coat the wheels and go for 4 new tires. 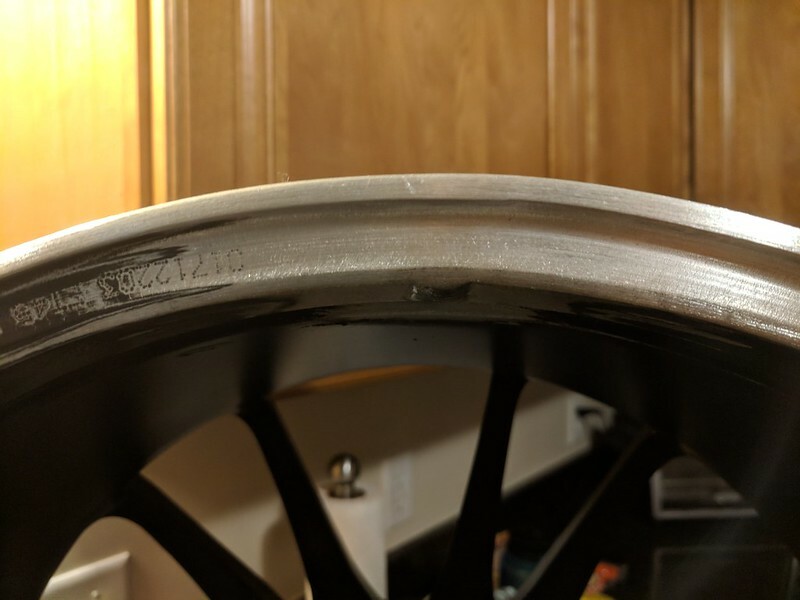 Trying to figure out if it's worth going through all this for a set of wheels that has a few small rash spots and at least 1 tiny bend (all from previous owner). 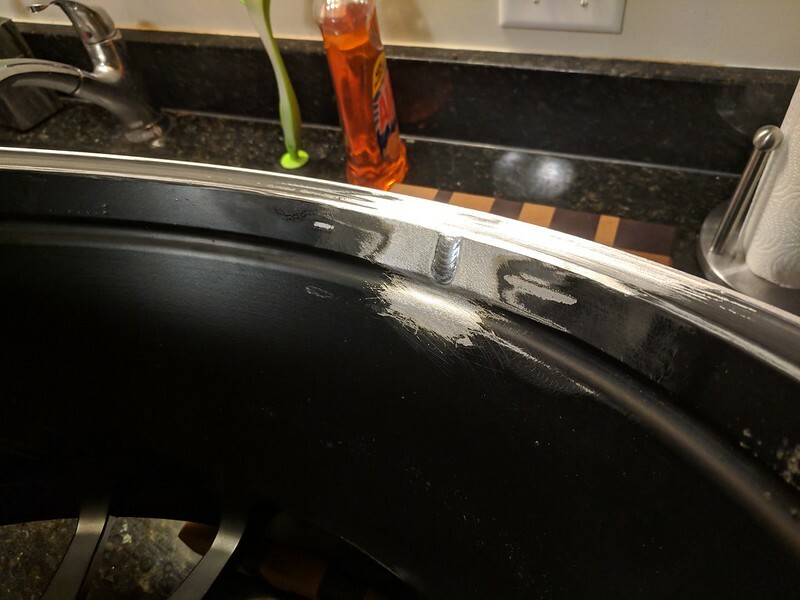 Guess I'll start researching wheel repair. Ugh. I had the crack welded up, all 4 wheels straightened, and all tires removed. 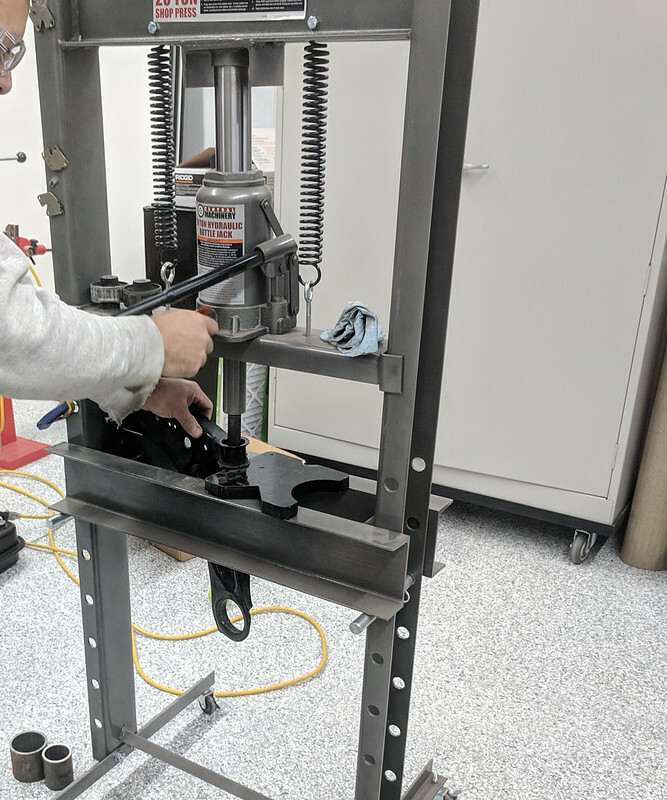 For anyone in the DMV area, TAS Machine Co. in Laurel has earned all of my future wheel/tire related business. They have a professional, organized shop and Brett is a straight-forward dude. I always look forward to stopping by the shop to chat with him and his crew. I need to find a weekend to get the wheels stripped of paint so I can start sanding and blasting in preparation for powder coat. 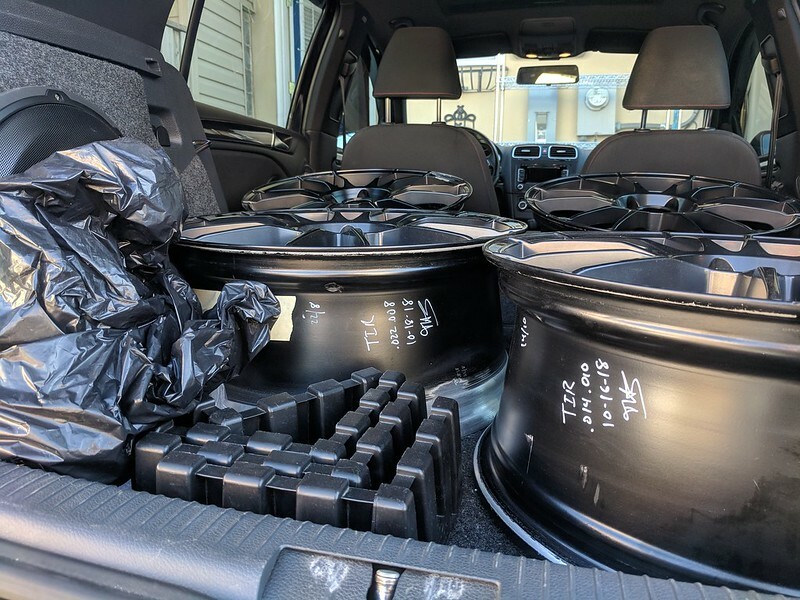 On the plus side I ordered some powder coat samples (for the wheels and a few other projects) and they're getting me excited to have these wheels finished! Wheels will eventually go back to TAS to have new tires mounted and balanced. Last edited by Tony48; 10-23-2018 at 03:53 PM. 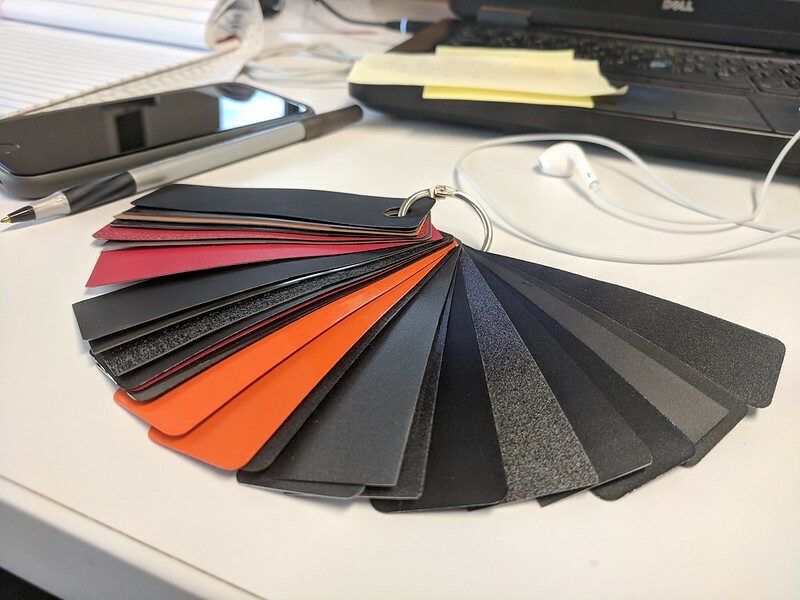 Man, can't wait to see what color you choose! I am doing something big on my car tomorrow, ddc coilovers! Wow that's awesome. I haven't seen anyone with an electronic damping system on a MK6...sounds like you will be in very exclusive company. 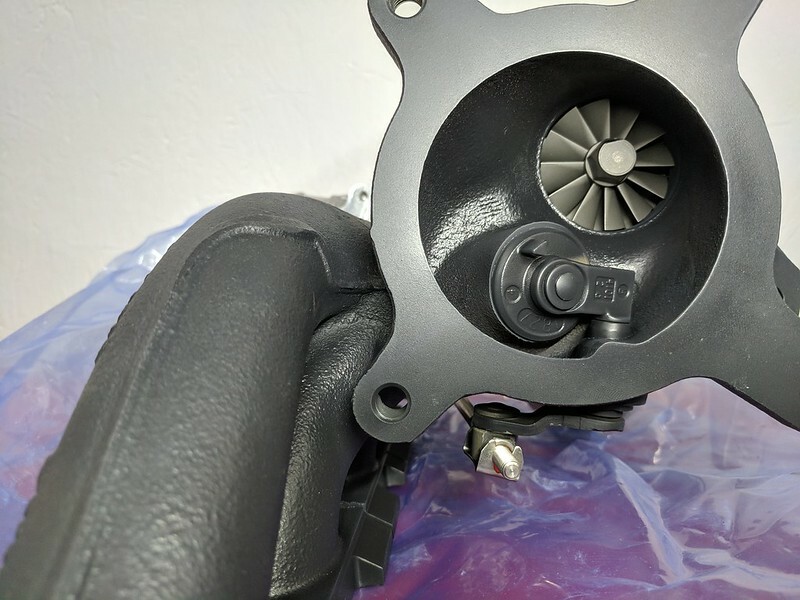 In Europe there was an option for DCC in the mk6 Golf R and highline jetta. In the US, there was no DCC option. I got the whole kit for $1500, brand new. Normally I think it's $3100 for the kit with the ecu. 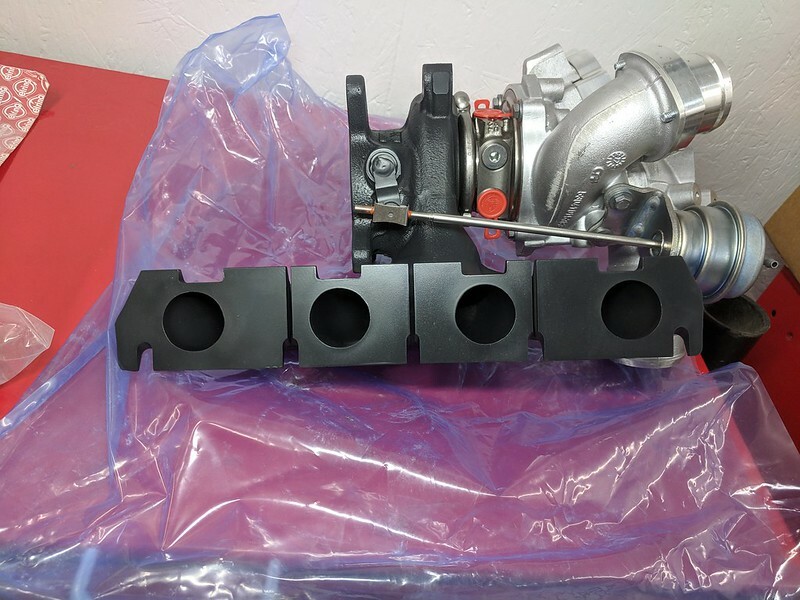 They still have one kit for the mk5, which should fit the mk6 for 1400, I think. Thanks for this. It's been key to my planning. I'm planning to tackle this one shortly. Just wondering did you find the torque spec for the balance shaft tensioner as well. Since I'm in there I'm just going to replace everything top to bottom. Just for peace of mind. Glad I can be of help. The balance shaft chain tensioner torque is listed on page 47 of the "Quick Reference Specification Book" PDF that is referenced in the timing chain post in this build thread. Here's a screenshot for reference. Torque is 85Nm (in case picture doesn't show up or eventually breaks). Make sure you have a standard depth 27mm socket. If you have any other questions let me know. I'd be glad to help you out. 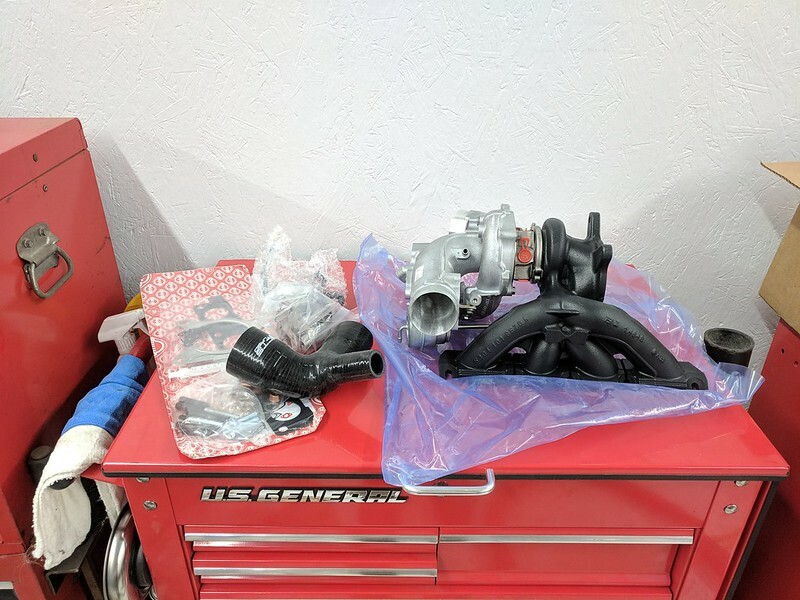 I ordered a CTS K04 a few weeks ago and had it shipped straight to Ruben at SoCalPorting for a port/polish and ceramic coat. Just received the K04 and it's looking mighty fine. I'm following the trail blazed by HYDE16 in his K04 Porting thread. 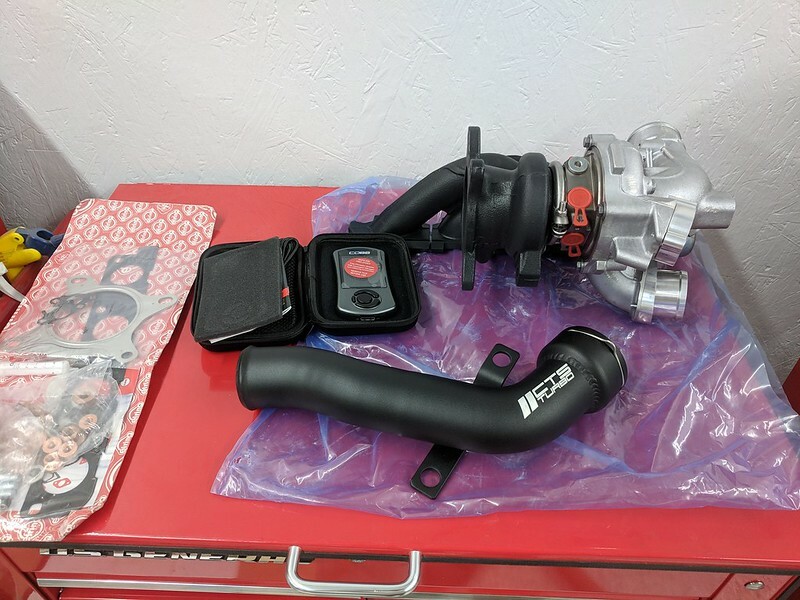 Unfortunately it will be a minimum of a few weeks until I can install this thing as I'm waiting on a base map from Stratified...yes, I also decided to ditch APR and go with a Cobb Accessport and Stratified ProTune. After speaking with Jared and Alex at Stratified I'm excited to begin the tuning process! The K04, Accessport, Turbo outlet pipe, and all gaskets/hardware will stay boxed up in the garage for the time being. So, I'm going K04 at 125k+ miles! K04 flickr album is here. I'll be adding pics as things progress. Last edited by Tony48; 11-12-2018 at 04:48 PM. Nice update man! Congrats on the move to K04. Its such a huge improvement in power over stages I or II, especially with all the highways around MD. I think APRs K04 tune is pretty solid for what it is. Still puts a smile on my face. Would be cool to maybe meet up sometime and feel how different the Stratified tune is. Maybe some day I'll make the jump too. Would be cool to datalog and such with the Cobb accessport. I really wanted the Accessport for the flexibility in being able to switch between tunes for emissions purposes. I don't expect I'll have any really significant power gains over an APR K04 tune. Plus it's cool to try out an e-tune. Stratified also told me they think they'll be able to code off the G611 radiator identification sensor so that's pretty appealing to me. 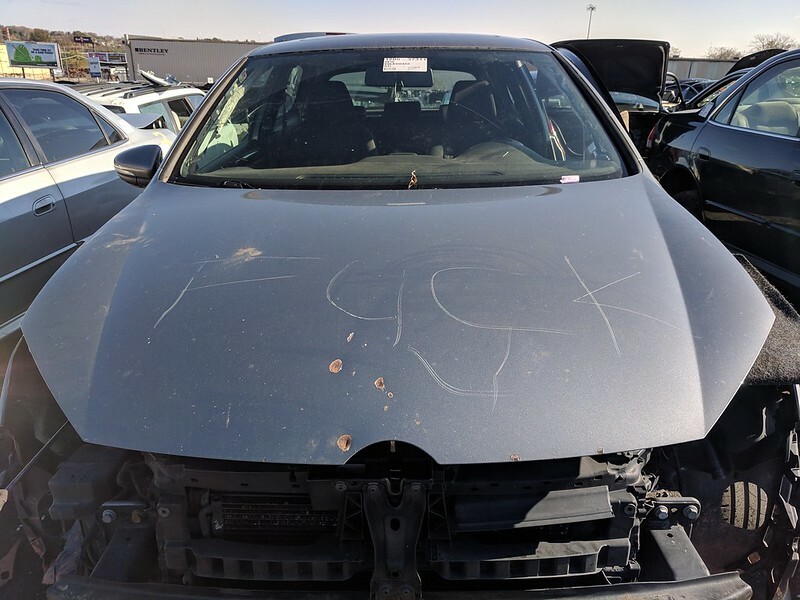 Would certainly be interested in comparing with your car! As with other APR tunes you can still switch between tunes via the cruise control stalk or the APR app if you have an iPhone. Either way, will be cool to have a custom tune thats different then what everyone else is running. I know it's possible to switch between tunes but I like the idea of having a tune that can be modified if I decide to go direct port WMI or something in the future. An APR tune would have done what I need but I like the future proofing of the AP and an e-tune. More than anything I wanted to try something new! 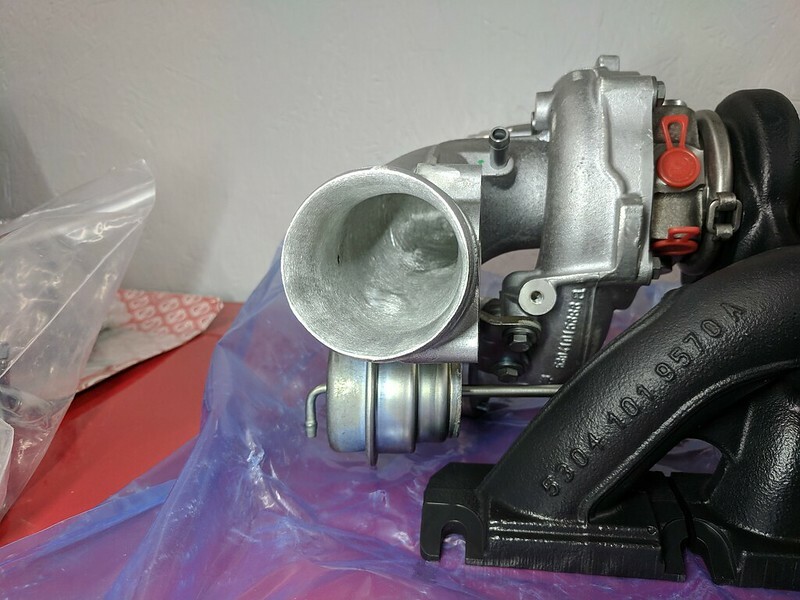 I've also read many mixed reviews of the APR K04 tune. Many people are super happy with it and have put down great numbers. Some others say it's peaky and not great for daily driving, not much power down low, etc. I'm sure it comes down to what version of the tune you have and many other factors. Working with Stratified means I can tell them I want a nice, smooth powerband even if it doesn't make the highest peak numbers. We'll see if my hopes and dreams for this tune are actually fulfilled and the e-tuning process is worth it! 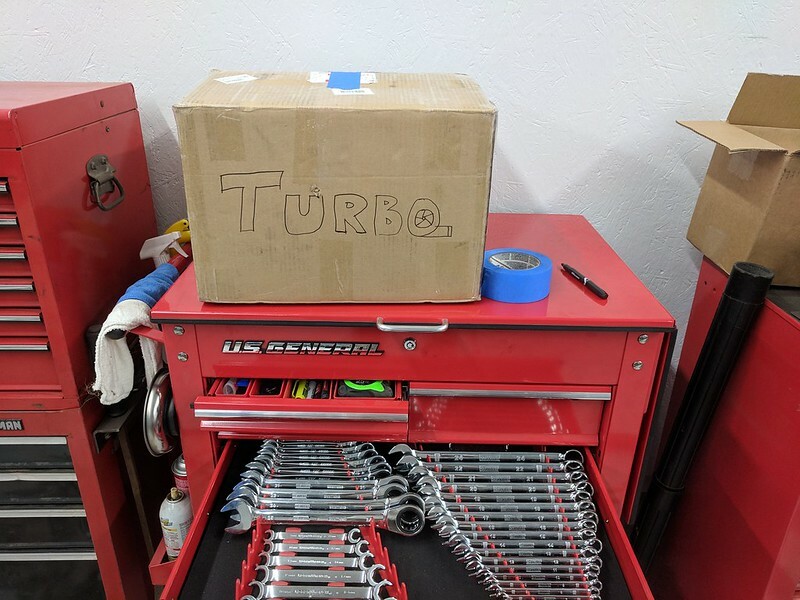 I figured that this will be my last turbo on this car so I might as well squeeze what I can out of it. Plus it's easier/cheaper to get it ported now as opposed to after it's been installed. 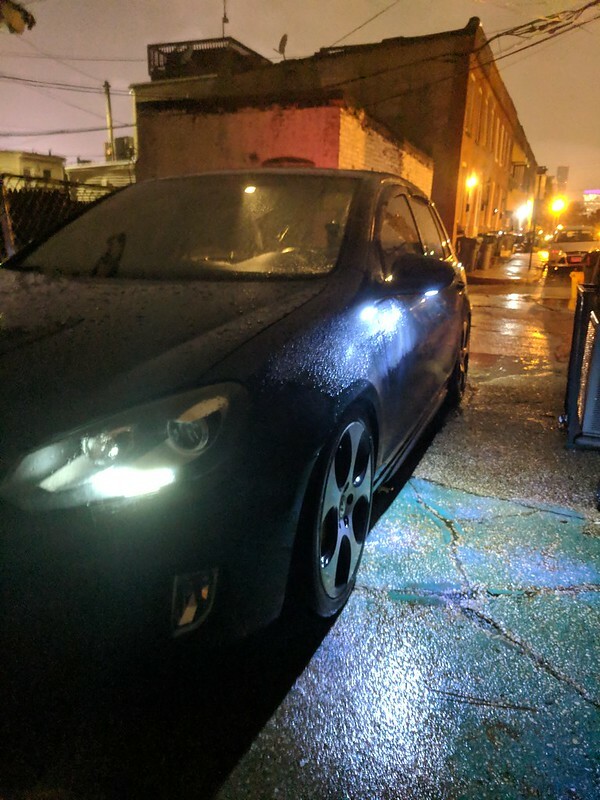 Couple random updates from over Thanksgiving...Got my LED puddle lights installed and coded. 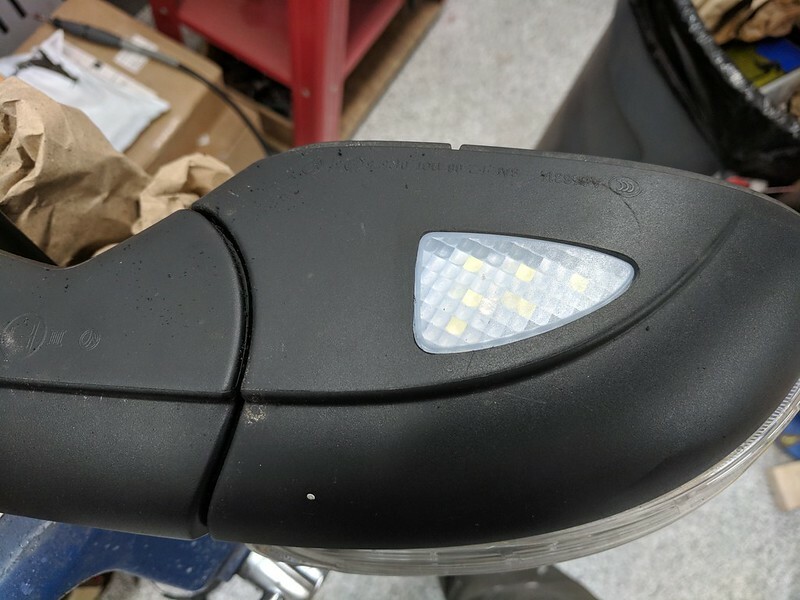 The lights themselves are straight from China and I had no issues dremeling out the side mirror housings and fitting them. The color temp is a little towards the bluish side of white but I can live with it. 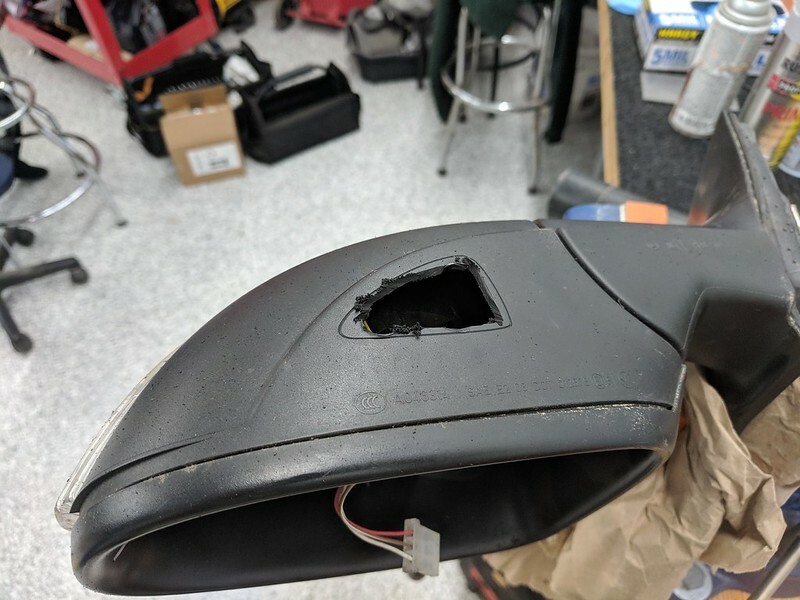 At the same time I started working on retrofitting the passenger mirror "Dip on reverse" feature that euro GTI's came with from the factory. 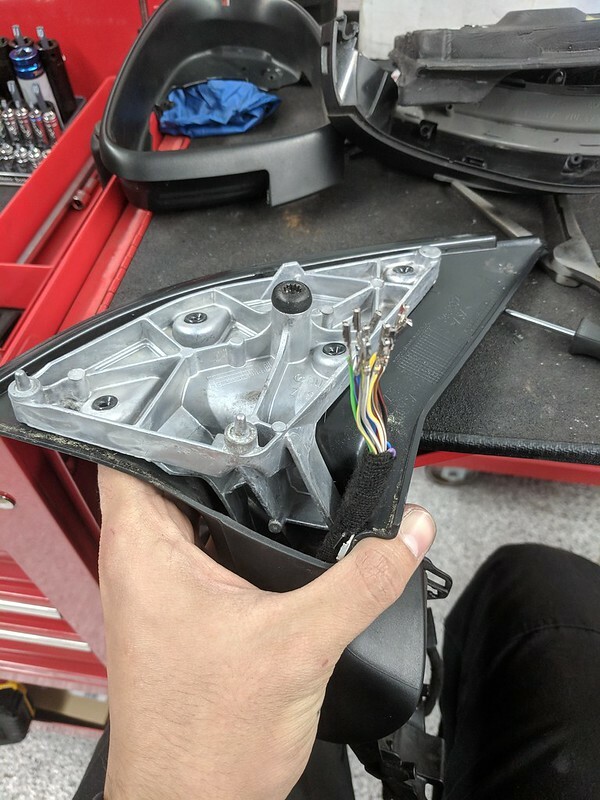 Still working on figuring that one out (with some help from BringerOdeath) but had to do some depinning of connectors to repair a few wires and fish the harness through the mirror assembly. Good learning experience since I hadn't previously used wiring diagrams for much other than quick reference. Door panel removal/reinstall is a piece of cake now that I've done it about a dozen times . 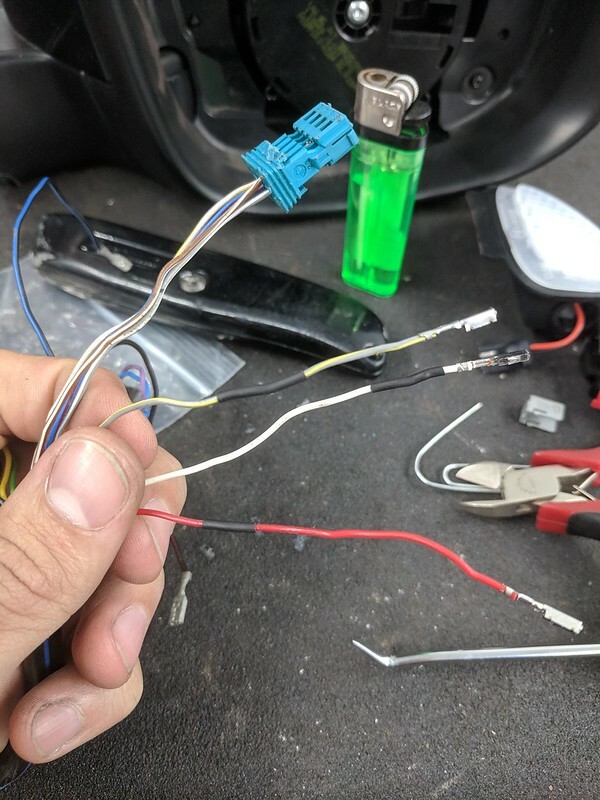 Wiring harnesses got the full cloth tape treatment for OEM quality and to prevent door rattles. 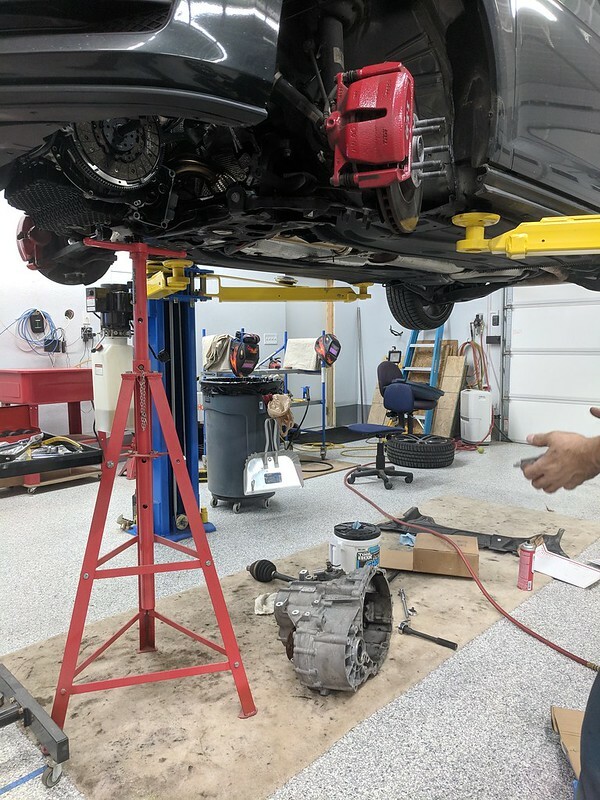 Next, spent a day and a half working on dad's MK7. Put in an RSR clutch and new DMFW. This was a bit tricky since he has a factory LSD that has to be dealt with. 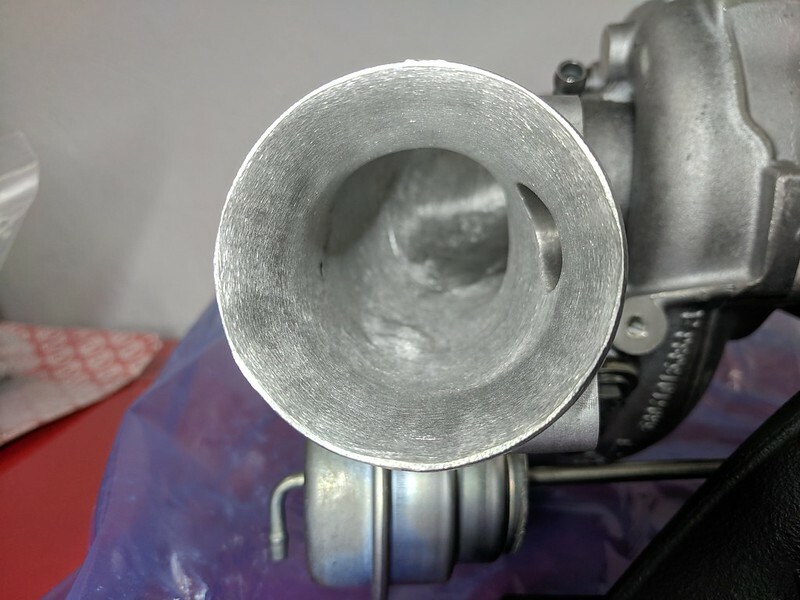 That involved removing his 3" downpipe to get the necessary clearance and making a specialty tool (aka 6mm hex bit welded to the end of an 18" piece of 1/4" rod) to get the passenger axle flange removed. PITA but it all went pretty smoothly once we had those things figured out. Also pressed out his front control arm bushings to replace them with SuperPro poly bushings and swapped in some Emmanuele Design lowering springs. A few mins with the block sander took care of the obscenity. And temporarily hung on the garage wall until I have some time for it. 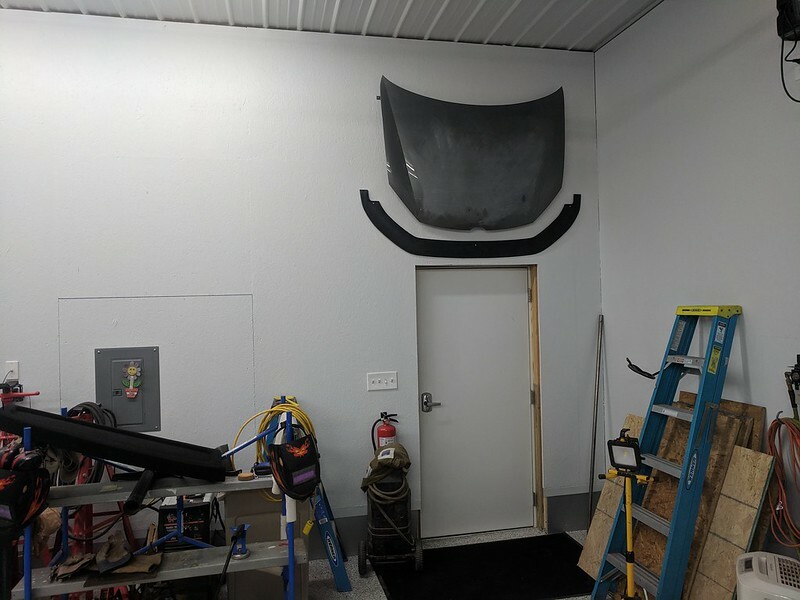 The plan is to use the hood to learn a bit of bodywork. At the minimum I will be pulling/filling the dents and priming. Toying with the idea of filling the hood notch and going badgeless front grille just because I can. I'm pretty indifferent to badgeless grilles on our cars but may end up doing it for the bodywork practice. I have to figure out what people typically do with the badge notch in the front bumper though! 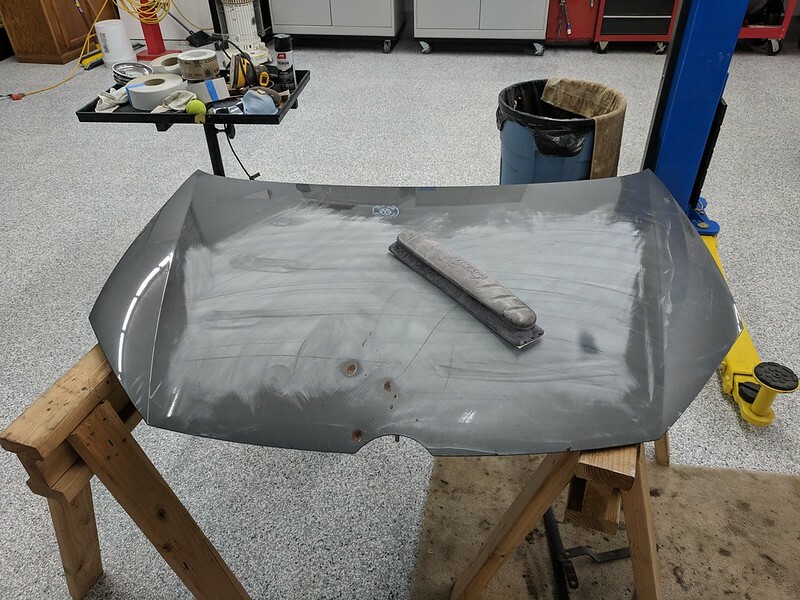 I still plan on vinyl wrapping the car eventually so I may not end up fully painting this hood Deep Black Pearl, but would like to, if only for the painting practice. K04 install coming soon...waiting on a base map from Stratified and a free weekend to install. I just filled out the tuning form and sent in a preliminary data log. In the meantime I have new engine/trans/pendulum mounts to install before K04 since my stock mounts seem pretty tired at 125k miles. Last edited by Tony48; 11-26-2018 at 03:45 PM.